All Aluminum Framework: An all-aluminum framework prevents rusting and reduces weight for less wear and tear on the truck and improved fuel economy. Insulation: The SSCMD has insulation on roof, floor, end walls and divider walls to insulate from outside temperatures and provides more efficient cooling and heating. Stainless Steel: Interior and exterior is stainless steel. Side Compartment Lift: The front passenger side animal compartment features a lift cage. This is extremely helpful when loading large animals. Simply open the exterior door, pull the cage out, press a button to lower the cage to the ground, load the animal, then reverse the procedure to raise the cage and secure it in the compartment. This feature does not require the ACO to lift the animal at all to load them. Doors: Stainless Steel exterior doors with heavy duty locking slam latches keyed alike. 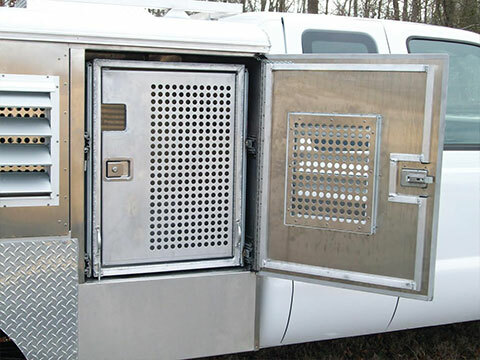 All animal compartment doors include operable louvers with interior shields. 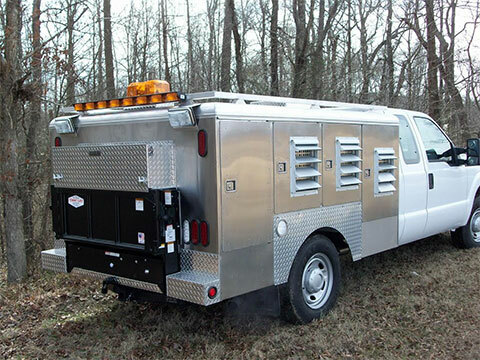 Includes gas struts to hold doors open when loading/unloading animals. Exhaust Fan: Includes a 12-volt dual squirrel cage exhaust fan. Ventilated: All animal doors have operable louver vents with perforated shields on the inside to provide excellent fresh air ventilation. AC/Heat: Includes a minimum 14,000 BTU Cooling/12,000 BTU Heating unit that is ducted into each individual compartment. Safety Doors: All animal compartments feature interior safety doors made with 1" aluminum tubing. The safety door includes a catch-pole notch so aggressive animals can be loaded/unloaded while still under the control of the catch-pole. Storage Compartments: Includes storage compartments on each side of the unit with shelves and carpeted floors as well as rear center storage area. 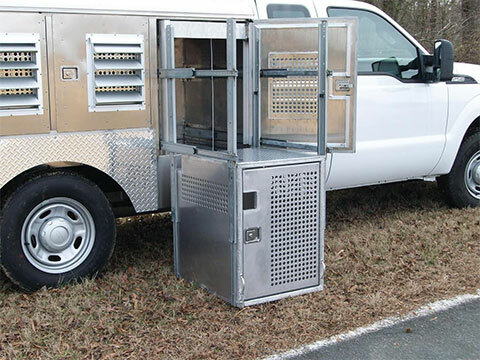 Lift Gate/Dead Animal Compartment: The rear of the unit features a lift gate and large storage area for loading/transporting dead animals, cages, etc. Clean-Out: All animal compartments have floor drains to make wash-out easy. The compartments also include a heavy duty rubber mat. Rear Step Bumper: A rear step bumper is built into the unit. Skirt: The sides of the unit are skirted to the bottom of the body line. Hinges: All doors feature full length stainless steel piano hinges. Lights: All lights are LED lights for low amperage draw. Lighting includes all DOT required lighting as well as side are clear lights, rear scene lights, rear directional arrow bar light, interior animal compartment lights and revolving roof mounted light. Rear Camera: Includes rear back-up camera. Roof Rack; Includes an aluminum tubing roof rack. This is useful when hauling traps on the roof as it provides a place to tie-off to. Roof: The roof is diamond tread aluminum to reduce heat transfer inside the animal compartments. Thermometer: Includes a digital thermometer with the display mounted on the dash allowing the driver to monitor compartment temperatures.